The Noon Mark Diner in Keene Valley is a popular landmark along the road to Lake Placid. the area around Lake Placid and the High Peaks, shown here in two photos from my most recent trip–in November of last year–that I’ve only just got round to uploading to my Zenfolio site. Then there are other areas that I know fairly well — and then there are vastly more parts that I would never have been able to discover at all without the help of Carl Heilman II’s new book, Photographing the Adirondacks: Where to Find Perfect Shots and How to Take Them. Carl Heilman II has lived and worked in the Adirondacks since the early 1970s. He has had the opportunity to find and photograph everything from the well-known iconic places to the more obscure ones. 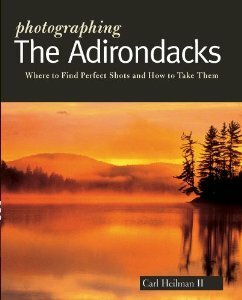 Now with the publication of Photographing the Adirondacks he generously shares his knowledge with us, offering descriptions of the places, directions on how to get there, suggestions for what to photograph and how, including the best times of day. Fall yields to winter over the High Peaks seen from the Plains of Abraham. very useful since, unless you’re fortunate enough to be spending a month or more there, you’ll undoubtedly want to choose one or perhaps two places on which to concentrate. The front of the book even has clear maps that include numbers corresponding to the numbers of each of the sixty-four sites described by the author. You can hardly get more practical than that. In brief, Carl Heilman II, one of the most prominent photographers working in the Adirondacks today, has saved you and me a great deal of time and legwork. Whether you’ve never been to the Adirondacks and are planning a trip there or, like me, you have your repertoire of favorite places acquired over the years and are eager to explore something new, Photographing the Adirondacks is a very valuable book to have. Our new photo book Historic Hudson Valley is now officially published!